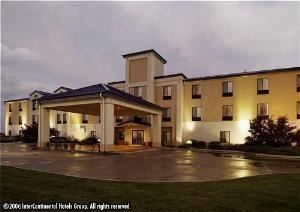 The Holiday Inn Express Hotel & Suites Garden City was newly renovated and all rooms are brand new. We are conveniently located on the east end of Garden City where Hwy 156 and bypass/loop hwy 83 converge. The hotel features a new Business Center open 24 hrs, 24 hour pool, whirlpool and fitness center, high speed wireless internet and on demand movies. The complimentary breakfast is served from 6:30am to 9:30am with our new hot bar with biscuits and gravy. Snack and beverage machines are located through out the building. The rooms feature 2 queen beds, or for longer stays, a king bed, with twin size sleeper sofa, a wet bar area including a fridge and microwave, a bigger work desk for the business traveler. We now have a limited pet section for our 4 legged guest. There are restaurants, shopping plazas, movie theater, Lee Richerdson Zoo and fair grounds with in miles. Garden City is the ideal place to stay if you're traveling on business or for pleasure.